Woroni | Sorry, Prime Minister Who? Once upon a time, Australia used to go to the ballot box and vote for a party, a team to become the federal government… unfortunately, the last time that happened was literally when I was five. I have absolutely no recollection of Australians voting for a government and then having that same, or substantially similar, government makeup when they next went to the ballot box three years later. The election has now been called, and truthfully, I have no faith that a re-elected Morrison Government will still have ScoMo at the helm in three years. In the last decade, we have had five different prime ministers: Rudd, Gillard, (Rudd again briefly), Abbott, Turnbull, and finally, Scott Morrison. It may be fun to watch the unscheduled media circus every time there is a leadership challenge but is variety what we really want for the nation’s top job? When Kevin ’07 was elected we we thought he would be in it for the long-haul. Tony Abbott promised stability following the Labor Party’s woes, but then the sad opinion polls saw him out too. On and on it goes, until we reach today – over a decade of party infighting, opinion polls determining the end of politicians’ careers. One of the biggest ironies is that the minority government, led by the first usurper Julia Gillard, was marked by more stability and passed more new laws than any of the coalition governments since. Now I do not like gambling, but I’m going to take a guess and say that the Coalition will lose the election. At least part of the reason is that nobody actually knows who is part of the Coalition. Naming government ministers has become like one of those niche Buzzfeed quizzes which test your intellect. Personally, I will be impressed if you can name just four government frontbenchers. For a PM who is supposed to specialise in marketing and slogans, he has failed to build brand recognition around his government. 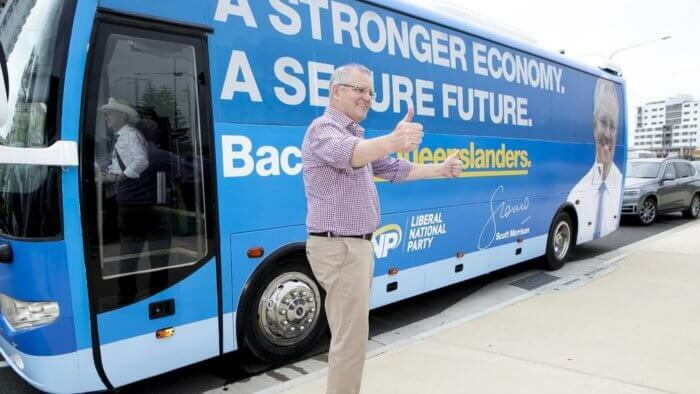 Sure, he might have created his own persona as a ‘fair dinkum’ bloke travelling the country in his bus, but he hasn’t done the same sell-job with his party. With many of the old guard, retiring and the party still unable to acknowledge that there are not very many female representatives, the only thing they’re trying to sell me is the budget (because that’s supposed to make me excited…). I know barely any of this government’s policies and don’t know if they’ve changed since old Malcolm was top-dog. All I get from the media is that it is a new face but the same product, and the government has done nothing to prove that wrong. Maybe I’m being unfair: there are so many members of Parliament and there is no way we can know them all. But with so many leadership challenges, and with so many ministers retiring from the Liberal Party, I have no idea what the next three years will look like if people decide to vote blue. In comparison, Labor at the moment may not be wholly stable, but at least I can name a few likely frontbenchers and have a basic knowledge of their voting records. More than anything, they’ve made a point of letting the media and voters know that they have learnt the lesson from the last time and will not be doing the same again. And they’ve been kind of orderly during their time in opposition. The ‘broad-church’ of the Liberal party has cracks in the building and a dwindling congregation. The Nationals are playing personality politics between the biggest male egos. It is going to take some real effort to make me believe that they can all play nice. Everyone has different things to think about when heading out for their May 18 democracy sausage, but one team certainly hasn’t assured me that they won’t fall apart halfway through the game. The Coalition government, the Labor party and the media make a big deal of the fact that there is a lot of infighting up on Capital Hill. Perhaps this is coming to be what we expect from Australian politics. But if this is the new norm, should we really just accept it? I think not. This is the election to make it clear that factional disputes should not determine who is the Prime Minister. And really, it should not be an idyllic dream to hope that the government at the beginning of their term actually resembles the government which seeks re-election. Ben Lawrence is the the Deputy Editor-in-Chief of Woroni. The opinions in this piece are his alone and are not representative of Woroni. If you would like to submit an article on the election, please email a pitch outlining your idea to write@woroni.com.au. No matter your political persuasion, it is important that you have your voice heard. Make sure you are enrolled to vote and that your details are up to date on the AEC website.